Mudrooms help us transition from our adventures in the great outdoors to the comforts inside our homes. But when packed with clever built-ins, space-maximizing storage and nifty organizers, a mudroom can also become a high-functioning, double-duty space that can accommodate anything from folding laundry to making crafts. Don't believe me? Check out these fantastic mudrooms and my space-saving mudroom organization tips to see how you can make the entry to your home attractive, functional and clutter free. Office space. Transform your mudroom into a double-function space with a built-in desk and file storage. One wall is all you need if you plan it right. The cubbies and hooks help keep outdoor gear and clutter separated from the desk area. Helpful hooks. Turn an awkward or a dead space into something you'll actually use. A row of simple hooks around the perimeter and a few well-placed wire baskets have turned this once-empty nook into a valuable drop zone near the home's entry. Neat and clean. Not all of us like to have our jackets and coats on display. 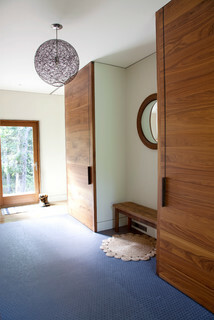 These floor-to-ceiling cabinet doors keep clutter out of sight and add an architectural statement. Laundry time. If you have a spacious mudroom at the back of your house, take advantage of all that room. Consider including a laundry section to make life a little easier. A washer, dryer and small sink mean you can throw dirty clothes right into the wash as soon as you get home. Pet station. If you share your home with furry friends, your mudroom is the perfect place for a doggie stop. 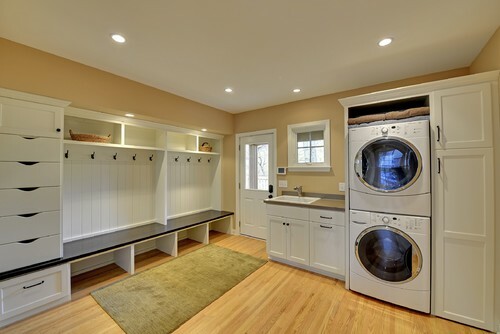 This pet-friendly mudroom's special space for cleaning pets means the owners will never see a muddy paw print in their house again. A sophisticated palette of durable materials makes it feel sleek, despite its practical purpose. Traditional Entry by Heber City General Contractors CD Construction, Inc. Seasonal storage. 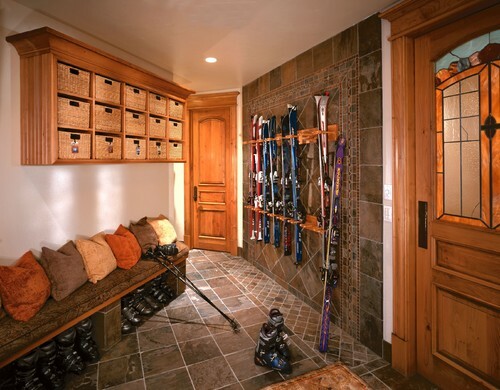 Mudrooms can be the perfect place in which to store outdoor sports gear for all four seasons, with the right organizational techniques. This ski-loving family came up with a great solution to keep their winter gear under control: Cubbies for gloves and hats up top, spots for boots below the bench and custom ski racks keep everything neat and tidy. Personalized. Clever and colorful solutions help bring this mudroom to life. 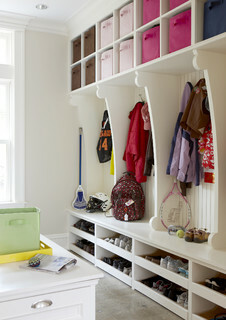 Let your little ones choose a favorite color to make their special space in your mudroom more fun. Color-coordinated baskets add a little personality to an all-white space with minimal cost and effort. 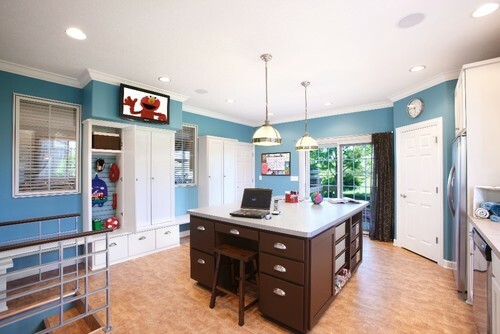 Modern Laundry Room by Rockford Interior Designers & Decorators KannCept Design, Inc.
Get crafty. If you have the room, incorporate a workstation into your mudroom. Wrap a gift, help your child with a school project or prepare a package for the mail on your way out the door. Having everything in one spot will make multitasking much easier.